Sikhs - Swords . . .
On the face of it, Anandpur Sahib, a sleepy town located in the northern Indian state of Punjab, seems far from being a historical site of repute. But it is this place that saw the birth of one of the world’s most vibrant religious orders, whose followers characteristically tie their long hair in a turban, sport flowing beards, pray at the gurudwara(literally, at the feet of the guru) wear a steel bangle on the right wrist, and occasionally, carry a small dagger, called a kirpan. These are the Sikhs, members of the warrior-devotee fraternity of the Khalsas (the pure), which was created at Anandpur Sahib way back in AD1699 by the martial Sikh guru Gobind Singh to fight against all kinds of injustice. But the story of the Sikhs starts much before the creation of this fraternity. It evolved under nine successive gurus for about 200 years till its culmination in the Khalsa brotherhood. The story begins with the gentle, but convention-defying poetry of the first Sikh guru, Guru Nanak. Gur Prasad—Realized only by His Grace. Etymologically, the word Sikh means a learner. With time, it came to define people who attached themselves to Nanak’s teachings during his extensive travels. His philosophy was simple: Naam Japo (chant the name of God), Kirat Karo (earn your living by working honestly), Vand ke Chhako (share your wealth with the needy). There was no ritual, no restrictions on diet, no idol worship, no celibacy, no self-denial—just enjoy life to its full and thank God for giving you the opportunity to live. Himself a householder, Nanak propagated a faith that gave the householder pride of place. Nanak preached that God is the creator, but not part, of the universe. The transcendence of God is made immanent in this world through Naam (God’s Will or Word). The highest ideal for a Sikh, therefore, is to be yoked to Naam and create a society of God-centered people. In order to organize a society that would uplift the outcaste and fight injustice, Nanak institutionalized a lineage of gurus. Till the fifth guru, Arjan Dev, the successors of Nanak concentrated mostly on setting up new towns, formalizing path-breaking social institutions like the langar (a common kitchen for all castes) and living the life of devotion and work. Throughout this period, India witnessed the rise of the Mughal Empire. Looking back on those formative years of one of the world’s youngest faiths, it seems as if the Sikh movement and the Mughal rule were destined to criss-cross each other. Wherever they intersected, there was a collision of beliefs. A large part of Arjan Dev’s leadership coincided with the largely secular rule of Akbar, and hence flourished unhampered. The highlights of his Sikh evolution under Arjan Dev were the creation of the world-famous Golden Temple in Punjab, India, and the compilation of the Sikhs’ holy book, the Guru Granth Sahib. But this peace was not to last long. Akbar’s son and successor Jahangir summoned Arjan Dev to his court and had him executed. Before leaving for certain death, the guru elected his son Hargobind as his successor, and his last message was: arm yourself and prepare for the struggle ahead. Although tension between Sikhs and the Mughals kept on rising, it was during the ninth Sikh guru Teg Bahadur’s time that it hit a flashpoint of sorts, when Mughal emperor Aurangzeb’s generals began forcible conversions of Hindus in the northern Indian state of Kashmir. Shocked, Teg Bahadur had it conveyed to Aurangzeb that if he could succeed in converting the guru, all the Hindus in Kashmir will accept Islam. In reply, Aurangzeb arrested the guru and beheaded him. The Khalsa brotherhood came into being about a decade after the intiation of Teg Bahadur’s son Gobind Rai, later known as Gobind Singh, as the tenth Sikh guru. Gobind Singh conceived the Khalsa after a strong mystical experience at the Naina Devi hills adjoining Anandpur Sahib, where he had established himself. Returning to Anandpur, the guru sent invitations to all Sikhs for a special assembly on April 13, 1699. On the scheduled day, Gobind Singh appeared before the congregation, brandishing a naked sword, and sought the head of a Sikh as sacrifice. A Sikh belonging to the kshatriya or warrior caste stepped forward. Gobind Singh led him to a tent pitched nearby, and reappeared a while later, his sword dripping with blood. Again, the guru sought the head of a Sikh. This time, a peasant Sikh came forward. Gobind Singh repeated the procedure thrice with a printer, a fisherman, and a barber. A while later, the guru emerged from the tent with the five Sikhs—alive and clad in saffron robes, turbans, and a sword hung at the waist. He announced that these five, the Panj Piarey (five beloved), represented the culmination of Nanak’s teachings, and would form the core of the Khalsa faith—a selfless, casteless, martial fraternity that shall stand for equality and purity. Gobind Singh then proceeded to administer amrit (literally, nectar), a mixture of sweets and water, to the five, and added the suffix Singh (lion) to their names. Women were also initiated and they were given the suffix Kaur. The five k’s of the brotherhood—kesh (hair), kada (iron bangle), kirpan (dagger), kangha (comb), kachcha (knee-length drawers)—were introduced. The Khalsa were enjoined to worship only one God, protect the weak, resist oppression, and consider all humans equal. 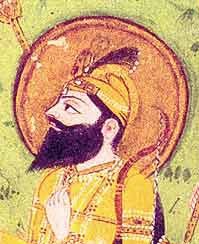 What followed was a series of battles with Aurangzeb’s forces, resulting in the martyrdom of the guru’s sons, his mother, and countless Sikhs. Gobind Singh himself suffered a mortal wound. Before his death, he ended the lineage of living gurus by declaring the holy Granth Sahib as the eternal guru of the Sikhs. Thus did Sikhism reach its final form—a finely sculpted sword whose razor-sharp blade opposes sin and whose firm hilt embraces humanity.